H. 11159 - this truly magnificent gulf access masterpiece is the perfect opportunity for the most attention-to-detail buyer. Excellent oversize lot in the prestigious gated cape harbour with an exquisite florida lifestyle. Super secure and electronic home entertainment is taken care of with its $80k, high end home entertainment system with touch screen displays throughout the home and 4 security cameras. Enjoy sunsets and more in this southern facing home while relaxing by your 42 ft pool with salt water system, a spa and is solar and elect. Heated. Or, sweat it out in your very own european sauna from eating a little too much after enjoying your inner chef in the spectacular state of the art gourmet kitchen. The kitchen boasts its own built in coffee/espresso machine, bronze jenn aire appliances and upgrades galore! In all, you have 6 br, 2 of them as masters. The second floor master offers a balcony with incredible views. Plus, dont forget your boat, the composite boat dock has a 16,000 lb boat lift so you can cruise out to the gulf anytime. H. 11393 - this dream home is located at the end of a cul-de-sac and intersecting canals, so it is quiet as quiet can be, this is even better than any riverfront location, as you are protected here. A wrap around boat dock suits boats up to 50' and on the side is a 10'000 lbs lift for your other toy. The pool measures 45' length and the rectangular tiki with a bar gives you the tropical lifestyle feeling. Watch the dolphins from the lanai or better even from the private dock with tiki hut, this is something you'll never forget. In the great room you will be impressed by a soaring 15' ceiling and the 9' high sliding door to the pool area providing you with a gorgeous view over the pool area to the waterfront. The home is surrounded by tropical landscaping with mature coconut palm trees, so you'll really feel what 'waterfront paradise' means. Rare opportunity to own a riverfront retreat in one of the most established neighborhoods in cape coral. A remodeler's dream, just add some upgrades and you have your beautiful, updated riverfront retreat. Prime location midpoint between the bridges with no traffic noise. This desirable property is right on the caloosahatchee, with seawall and dock already in and all assessments paid. 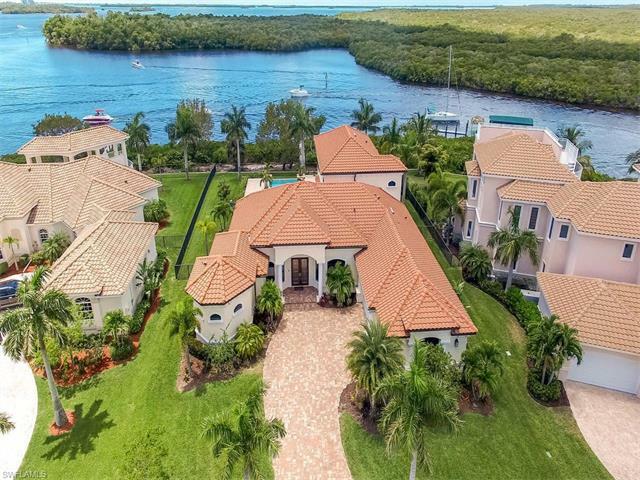 Enjoy the serene views of the caloosahatchee river from your custom private pool and spa while you capture the beauty of the southwest florida tropical landscaping and waterways. In the back, home is equipped with a well-maintained dock which can support a 12000 lb. Boat. The original home was built in 1974, and in 1994, was rebuilt after being taken down to one wall in order to retain original elevation. Great floor plan with 10-foot ceilings throughout, and truly impressive master suite. Ideally located in the sought-after community of savona with excellent dining, shopping and entertainment close by. Rarely do properties on this prestigious riverfront section of the southeast cape become available. Unique in every way. Don't let this opportunity slip away, schedule your appointment today! H. 11108 - wide open views on lake roundtable and southern exposure will have you relaxing by the pool on the expansive lanai watching every sunset. Former model home in prestigious cape harbour will simply wow the most critical buyers. With deep water sailboat access your boating dreams come true. Boasting one of the best views the home also offers first floor master with 2 bedrooms upstairs with family room for added upstairs living areas, plus a balcony to enjoy the fantastic views from up top. You wont believe the upgrades in the gourmet kitchen and throughout the home. This is the most amazing deal in cape harbour dont wait or it will be gone. H. 11447 - enjoy magnificent riverfront living from this impressive beauty with unrestricted direct access to the gulf of mexico. Offering full panoramic views from this almost half acre lot which allows for the feel of complete privacy. This homes is perfect for boaters with its dock w/16000lb lift where you boat can be stored. Then if you have more toys then the dock can handle the extra tall 1000 sq ft garage is perfect boats, toys, or even an rv! Inside you will find a beautifully kept home just waiting for its new owners fun new touches. Enjoy your kitchen in the center of the home where family and entertaining will be sure made easier as others gather near. Once ready to dine, you will have your choice of a nook in the kitchen, formal dining or outdoors on the extensive lanai. The master boasts a walk in shower and a jetted tub for relaxing after long hard days. The great room has pocket sliding doors that open all the way up to the huge lanai offering a large paved pool deck with electric heated pool. Direct gulf access home with no bridges, just minutes from the caloosahatchee river!! This 4 bedroom, 4 bath, 2 story home located in a boaters paradise. Home features an open floorplan which overlooks the pool, boat dock, tiki hut and canal views right from your kitchen. Property has a 3 car garage, large circular paver driveway which is on a cul de sac street. Being sold as is, where is, buyer is responsible for all inspections. All information and property details are deemed reliable but not guaranteed and should be independently verified if any person intends to engage in a transaction based upon it. All room dimensions are approximate & need to be verified by buyer. This is a must see!!!! Hurry and schedule your appointment to see this well maintained home with sail boat access to the gulf of mexico. This is florida living at it's best, from the newly expanded boat dock with a tiki hut, to the great room floor plan you will feel like your on vacation all year long. The home features 3 bedrooms and 2 bath with aden. The master suite has direct access to the pool area along with a beautiful master bath featuring a jetted tub and separate shower and dual sinks. The open updated kitchen serves out to the spacious great room to make entertaining open from all areas. Direct access to the gulf and proximity to cape harbour makes the location excellent.